Green bean casserole is a family dinner favorite, and we show you how to transform this classic side dish into a modern, healthy one that your family will love. Simply use VOSKOS® Plain Greek Yogurt in place of canned soup for a creamy mushroom sauce that’s much lower in sodium and beyond delicious. Preheat oven to 400°F. Bring a large pot of salted water to a boil. Add the green beans and cook until just tender but still firm, about 5-7 minutes. Remove the beans from the water to a large bowl of ice water to preserve color and stop cooking. Drain the beans and set aside. Melt 2 tablespoons of butter in a large skillet over medium heat. Add the onions and sauté until translucent. Stir in the mushrooms, season with salt and pepper, to taste, and sauté about 3-5 minutes. 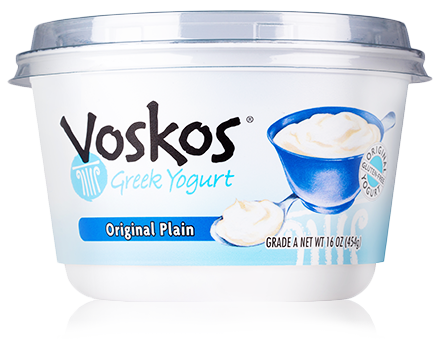 Add the flour and stir another minute, to cook out the raw flour taste, and then whisk in the VOSKOS® Plain Greek Yogurt. Simmer for just a couple minutes to bring the flavors together and taste for seasoning. Spread the green beans over the bottom of a 9-inch casserole dish. 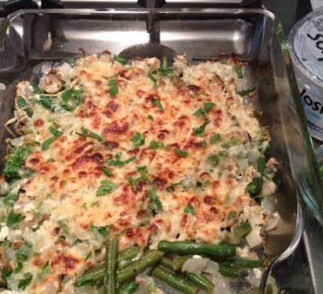 Pour all the mushroom sauce mixture over the beans and top with the grated cheese. Sprinkle the fried onions on top and bake for 20-30 minutes until light golden brown and bubbly.